Jinny Ng’s (吳若希) sudden marriage to Macanese heir Alex Ho (何兆鴻) was not without gossip. After giving birth to daughter Giselle in 2017, fans half expected Jinny to lay low while taking care of her infant daughter. 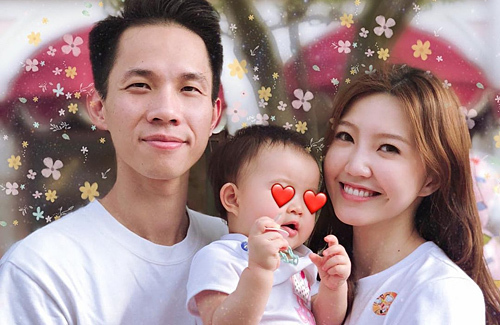 But the TVB singer has been quite vocal about her new family life, and even dropped a controversial statement last year about how she didn’t forgive Alex about his “betrayal” until after Giselle’s birth. But it’s not picture perfect for the couple. By seeing how the couple are constantly trying to affirm their strong feelings for each other over social media, Hong Kong media has speculated that Jinny and Alex are trying to overcome a rough patch in their relationship, which Jinny later admitted. Recently, the 26-year-old mother shared on Instagram that she has set herself a 30-day challenge, in which she would list out one positive quality of her husband to prove how much she loves him. Jinny finally completed that challenge today, and Alex responded. He said he is thankful for his wife for finding many positive qualities in a person who has too many negative qualities. Shortcomings are normal, and Alex said Jinny herself is not flawless. who is this guy? is he related to Stanley ho? @janet72 read somewhere that he is from Macau and rumors that his family shares some distant relatives with Stanley Ho’s family. Obviously he has money, but I wouldn’t say excessively rich, or else why would Jinny Ng still be working now? she’s only 26?? i thought she was at least 32 or 34….